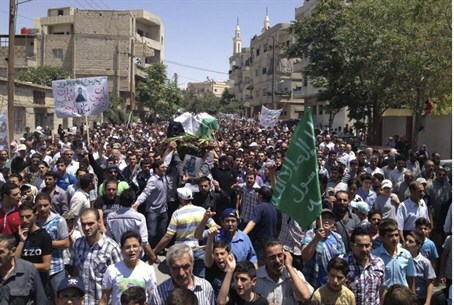 Reports in the Arab-language press indicate the head of Iran's covert foreign operations Quds force was killed in Wednesday's bombing in Damascus. Al-Quds Force's long-elusive commander, Maj. Gen. Qassem Suleimani, is reported to have made several trips to Damascua to meet with Assad and his top commanders since January of this year. Iran has made no bones about having bolstered Assad's embattled regime with members of its own elite Revolutionary Guard, but the death of Suleimani would be a direct blow to Tehran. Suleimani, who masterminded al-Quds Force operations in Iraq and covert activities throughout the Persian Gulf and Lebanon, is a key figure in Iranian policymaking, particularly in security matters. A combat veteran of Iran's 1980-88 war with Iraq, Suleimani took command of the al-Quds Force in the late 1990s and has become a powerful figure in the upper echelons of the Tehran regime. His death in Wednesday's bombing could indicate Syria's rebels have covert support from Western nations in their anti-Assad campaign. The United States, along with its allies, would like to see regime change in Damascus and end Syria's alliance with Iran, forged in 1980 by Assad's late father, Hafez Assad. Israel, the United States, and Saudi Arabia all have known scores to settle with Suleimani. Riyadh and Washington recently blamed the Quds Force for a failed attempt to assassinate Saudi Arabia's ambassador to the United States. Jerusalem blames the Quds force for the deadly bombing of a Jewish community center in Buenos Ares eighteen years ago, as well as a recent spate of bombing attempts targeting Israeli diplomats abroad. Suleimani's death may also explain the verbal aggression of Hizbullah leader Hassan Nasrallah towards Israel in a speech he delivered following Wednesday's attack. The Quds Force and Hizbullah terror organization in Lebanon have a long-established relationship, which Prime Minister Binyamin Netanyahu called out on Wednesday following a bus bombing in Bulgaria that left at least six Israelis dead and dozens more wounded. Iran also openly helped Hizbullah target US interests and personnel in Lebanon in the 1980's, and is believed to have advised the terror group when it carried out its deadly attacks on the US Marine Corps baracks and Embassy in Beirut. Officially established thirty years ago, the Quds Force had as many as 2,500 members in Lebanon in 1982, and continues to provide military advisers to Hizbullah and other anti-Israel terror groups. During Israel's 2006 war with Hizbullah, IDF personnel unconvered identification and documents for Quds Force members who actively fought against Israel. Meanwhile, Syria's rebels -- of whom the Free Syrian Army of some 30,000 army defectors comprises the largest faction -- continue to accumulate successes: the long-loyal Division 61 defected in Damascus, while ammunition depots were looted by rebels. Elsewhere, residents in Aleppo took to the streets to celebrate as rebels moved into the city, while the once impregnable Assad bastion of Damascus has become a fierce battleground as the rebels press their offensive deeper into the capital. Meanwhile, Al-Arabiya TV reported that the Syrian security forces are shelling areas adjacent to the Golan Heights. Israel has placed its military on high alert and cancelled all weekend leaves out of concern the fighting could spill over into the Jewish state.